I left Billings at 3:35 am so that I could get out to the lek and get set up before the birds arrived. 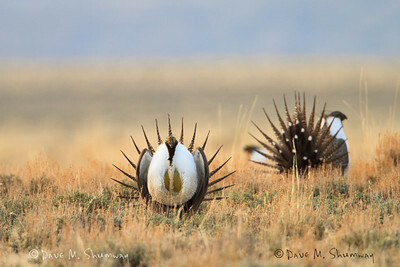 This particular lek has upwards of 60 displaying males at a time. The morning of the 21st was beautiful; but because of my blind position I was only able to count 39 displaying males; but I could hear more. A long lens, ground blind, and lots of patience is required to make a go at photographing grouse leks. I'll keep making more trips this spring, so look for more photos to come soon. Check out the photos and play the videos too (audio and all).